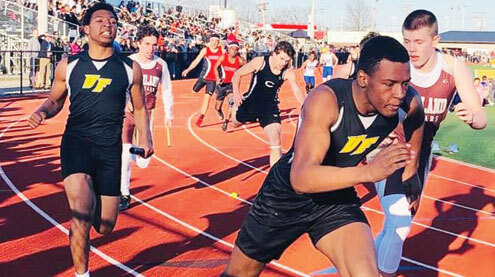 Van-Far senior sprinter Verlyn Johnson broke the school record in the 400 meter run on Thursday, March 21 at the Monroe City Open. Johnson ran the 400 meters in 51.17 breaking the 2018 school record set by Parker Wallace of 51.20. 100 meter dash – Anthony Garland, 19th, 13.31; Parker Hull, 34th, 15.17. 200 meter dash – Verlyn Johnson, 3rd, 23.96; Dillion Minor, 5th, 24.69; Verdell Johnson, 6th, 25.47; Preston Burnett, 14th, 26.63. 400 meter run – Verlyn Johnson, 1st, 51.17; Dillion Minor, 4th, 55.03; Preston Burnett, 14th, 58.91. 1600 meter run – Samuel Hazel, 5th, 5:22.41. 3200 meter run – Samuel Hazel, 5th, 12:19.76; Cayden Caldwell, 9th, 13:35.44; Ennis Childs, 12th, 14:18.41. 4×100 relay – 7th, Bryson Lay, Preston Burnett, Verdell Johnson, Anthony Garland, 50.14. 4×200 relay – 2nd, Brogan Wheeler, Brennan Wheeler, Verlyn Johnson, Dillion Minor, 1:37.27; 10th, Preston Burnett, Anthony Garland, Verdell Johnson, Bryson Lay, 1:45.83. 4×400 relay – 3rd, Brogan Wheeler, Brennan Wheeler, Dillion Minor, Verlyn Johnson, 3:53.78. 4×800 relay – 6th, Morgan Slatten, Samuel Hazel, Mel Troy, Julian Holtkamp, 9:40.93. Shot Put – Maximus Roed, 11th, 35-08; Dayton Sanders, 13th, 35-03.50; Ashton Garnett, 29th, 27-08.50; Dominic Blackwell, 30th, 25-10.50. Discus – Dayton Sanders, 10th, 97-08; Maximus Roed, 14th, 94-09; Ashton Garnett, 18th, 88-03; Brayden Prior, 29th, 58-04. Javelin – Caden Wilburn, 8th, 111; Maximus Roed, 15th, 94-01; Anthony Garland, 27th, 67-01; Brayden Prior, 28th, 66-11. High jump – Julian Boltkamp, 7th, 5-04. Triple jump – Brennan Wheeler, 10th, 36-10; LaTrell Wright, 16th, 34-05.75. 100 meter dash – Makenna Unglesbee, 31st, 16.94; Sharon Baur, 32nd, 17.21; Reagan Wright-McAfee, 35th, 18.10; Alexis Dyke, 38th, 20.96. 200 meter dash – Kaylen Culwell, 24th, 34.08; Madilyn Ingram, 28th, 36.68; Jocey Bontz, 29th, 39.08. 400 meter run – Jayle Jennings, 5th, 1:11.04; Breanna Carman, 21st, 1:17.14. 800 meter run – Madelyn McAfee, 8th, 2:51.54. 1600 meter run – Madelyn McAfee, 9th, 7:00.25. 3200 meter run – Jayle Jennings, 3rd, 14:09.20. 100 meter hurdles – Caitlynne Flowers, 21st, 31.12. 4×100 relay – 11th, Madalyn Swafford, Kaylen Culwell, Kirsten Scott, Makayla McAfee, 1:00.59; 14th, Madilyn Ingram, Caitlynne Flowers, Makenna Unglesbee, Shyonna Martin, 1:07.75. 4×200 relay – 10th, Alayna Bryan, Kaylen Culwell, Kirsten Scott, Madalyn Swafford, 2:08.79. 4×400 relay – 7th, Alayna Bryan, Madalyn Swafford, Madelyn McAfee, Kirsten Scott, 5:19.20. Shot put – Jordan Garner, 7th, 30-02; Cheyenne Martin, 18th, 23-02; Jordan Eckhoff, 23rd, 21-10.50; Rebecca Calvin, 28th, 19-07. Discus – Jordan Garner, 1st, 118-05; Rebecca Calvin, 31st, 52-02. Javelin – Jordan Garner, 6th, 96-09; Jayle Jennings, 11th, 87-10; Makenna Unglesbee, 23rd, 50-05. Long jump – Makayla McAfee, 19th, 13-01.50, Caitlynne Flowers, 31st, 11:05.50.